It’s here! Broadcast March 31, the interview with Peggy Herrington and Jonathan Miller by Sherri Burr’s PUBLIC ARTS TALK TV show is now available online. 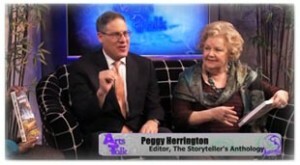 Watch as Jonathan and Peggy discuss the inspiration and motivation behind The Storyteller’s Anthology. Please share your thoughts about the anthology and this video below.